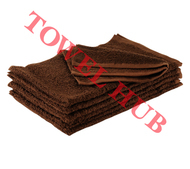 Description: Wholesale Black Hand Towels 100% Cotton. Double Stitched at hems for long laundry life. Used widely by Salons, Spas, Teams, Schools, Colleges, Gyms, Clinics, Hospitals, Cleaning companies and businesses who need a small hand towel. Great price offer! Description: 100% Cotton Burgundy hand towel made with ring spun cotton. DOUBLE STITCHED at hems for extra strength and durability. Excellent wholesale pricing! OVERSTOCK CLEARANCE!!!! Description: Lime Green Hand Towels available Wholesale. Beautiful color, DOUBLE STITCHED at hems for durability during washes. Perfect for Salons, Gyms and Sporting activities. Looking for a higher quality check out our Premium Plus hand towels. Low prices!!! Description: MEGA OVERSTOCK CLEARANCE!!! Orange Hand Towels available in Bulk made with 100% Ring Spun Cotton. DOUBLE STITCHED at hems for durability during washes. Great to use at Salons, Sporting Activities, Gyms & Athletic centers. Available at a great deal here!!! Description: ONE TIME MEGA CLEARANCE!!!! Wholesale Yellow 16x27 Hand Towel made with 100% Ring Spun Cotton of Standard Premium quality. Great to use by Gyms, Salon and Sports activities. Description: Wholesale Dark Green Hand Towel in 15x25 size. Perfect hand towel for Salons, Spas, Gyms, Golf & Country Clubs, Sporting Activities, Athletic Centers, Teams etc. DOUBLE STITCHED at hems for extra strength and durability during washing cycles. Description: Charcoal Hand Towel available in Bulk. DOUBLE STITCHED at hems for extra strength during laundering. EXCELLENT BARGAIN!!!!! Description: Navy Hand Towel available in Bulk. Perfect to us by Gyms, Golf & Country Clubs, Salons, Sporting Activities etc. DOUBLE STITCHED at hems for extra strength and durability during laundering. Available at a low wholesale price!